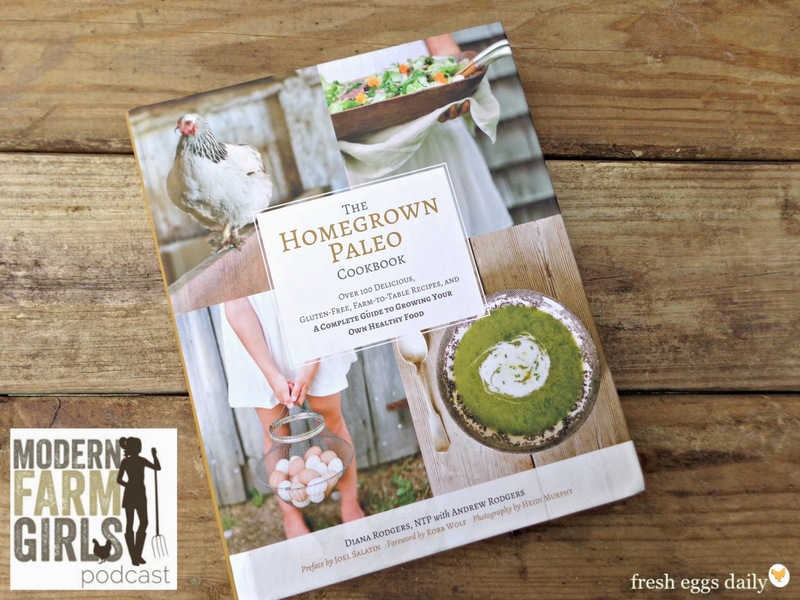 I recently had the pleasure of chatting with Diana Rodgers, host of The Modern Farm Girls Podcast and author of Paleo Lunches and Breakfasts on the Go and The Homegrown Paleo Cookbook and fellow chicken and duck keeper. We had fun talking about chickens, ducks, gardening and eating healthy. Of course we talked about Diana's new cookbook and a bit about my new book due out this fall. Just two farm girls chatting over cups of coffee. You can listen HERE. 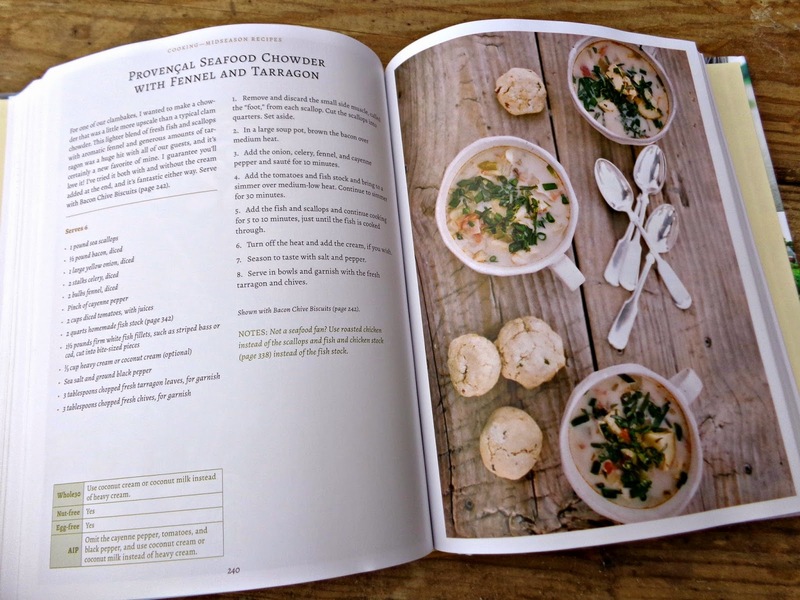 A few weeks later, Diana sent me a copy of her new book The Homegrown Paleo Cookbook as a thank you for appearing on her show. I was really excited to receive it because although I don't necessarily follow a Paleo diet - and honestly am not even sure about all the 'rules' of Paleo eating - after reading her book, I know that if Paleo means eating lots of fresh, nutritious foods while they're in season, without feeling like you're depriving yourself of anything, I'm all over that! Her book is beautifully photographed. 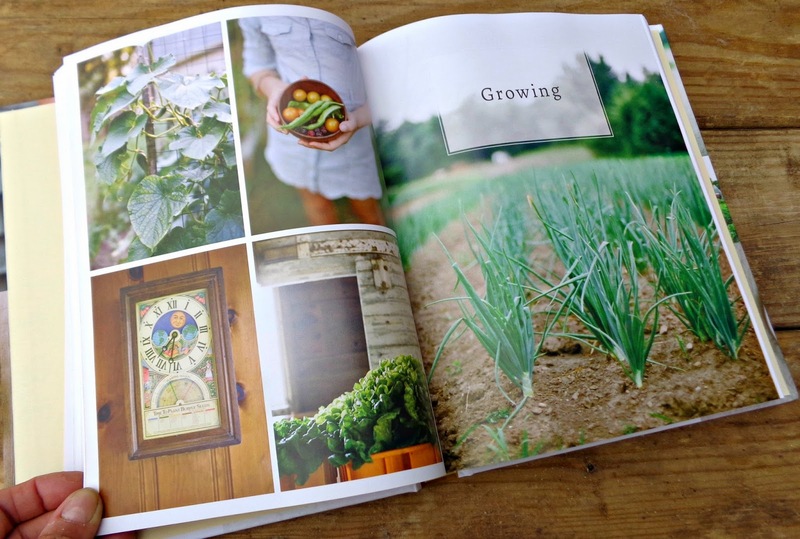 It includes tons of recipes using garden produce, fresh eggs and meat, but also includes growing and planting tips, tips on setting up a homestead whether you have 1/8 acre, 1/4 acre or more land to work with, and how to raise all kinds of animals from chickens to goats to bees. 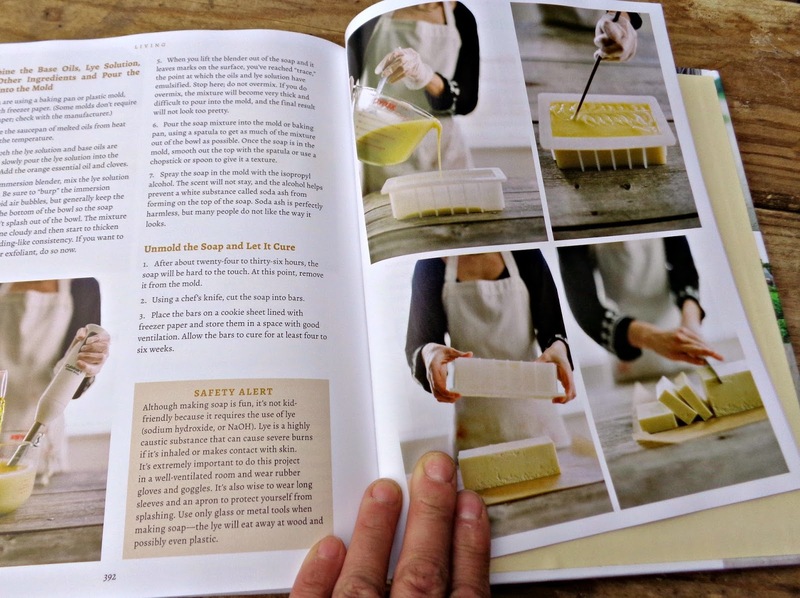 She shares tips on caring for your cast iron pans and making your own candles and soap. 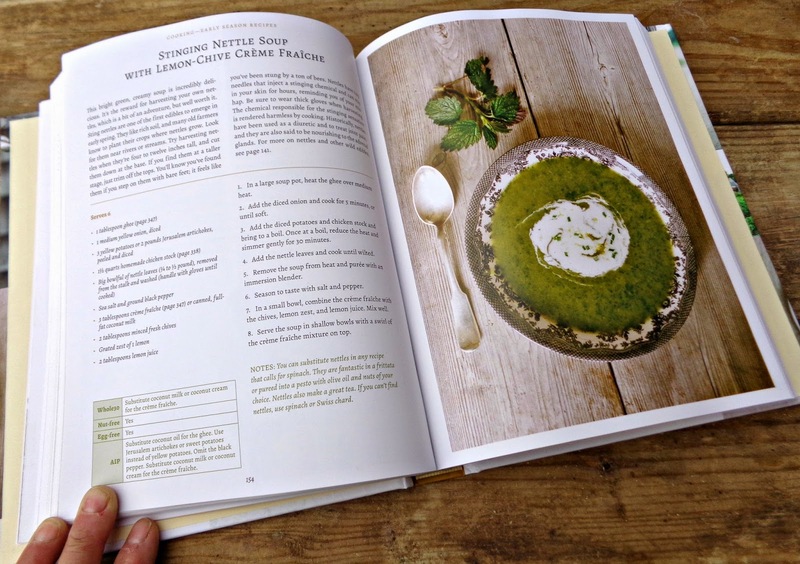 Of course there are recipes, lots and lots of recipes arranged seasonally, and each accompanied by a gorgeous photograph and easy to follow instructions using everyday ingredients that you can easily grow yourself. It includes such delectable dishes as Cinnamon-Basil Breakfast Sausages, Grilled Eggplant Stacked with Indian-Spiced Beef, Cardamom-Ginger Pots de Creme, Sea Scallops with Ramps and Wilted Lamb's Quarters and my personal favorite Rhubarb Ginger Sauce. But more than a cookbook, it's a true lifestyle book, meant to inspire and encourage us all to eat healthier, live better and try our hand at raising a few animals and vegetables! I highly recommend it. I know it has a permanent place on my kitchen counter. 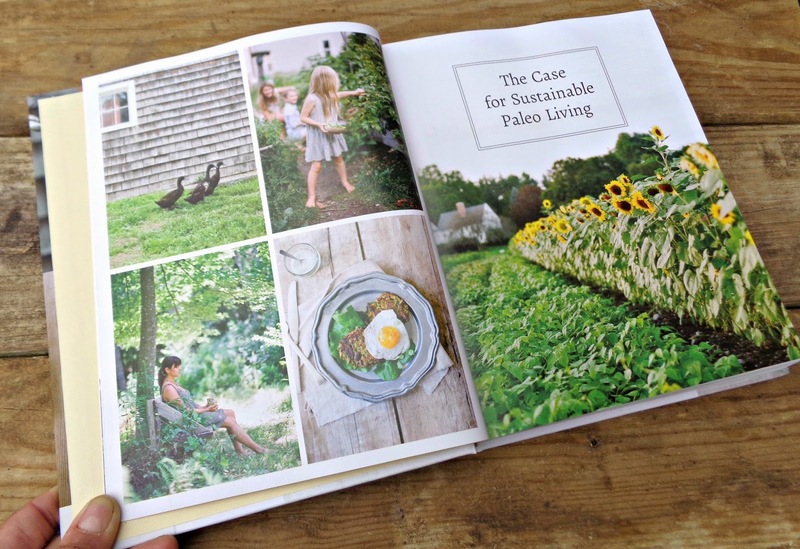 The Homegrown Paleo Cookbook: Over 100 Delicious Gluten-Free, Farm-to-Table Recipes, and a Complete Guide to Growing your own Healthy Food by Diana Rodgers (Victory Belt Publishing Inc, 2015) Highly recommended by this farm girl! 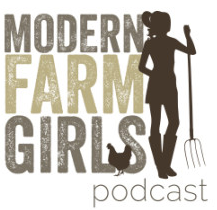 Listen as I chat with Diana Rodgers from Sustainable Dish on the Modern Farm Girls Podcast. 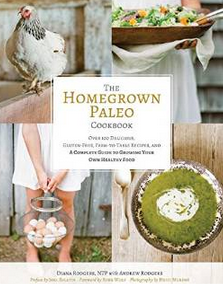 Buy Diana's cookbook The Homegrown Paleo Cookbook on Amazon or where ever books are sold. No rules really to the Paleo way of eating, just real whole unprocessed food. If possible make it organic, grass fed, pastured, how food was before we started messing with it. Oh that looks so pretty! I have Practical Paleo (sort of - it's my stepdaughter's) but I could definitely use this one too! I love it! Sounds so common sensical. If I were to 'diet', that would be how I would eat. Oh, wait, that IS how I eat! “LOVE is the key to LIFE” Glorious be unto Dr. Ukaka the great man and ever, my name is Lisa Buckley from Taxes city Usa. since 1 and a half year I have witness what is called heart broken. my boyfriend that promised me marriage failed me and impregnate me and leave,he dump me,he stop calling" he stop picking my calls,and he no longer respond to me. I have be looking for solution,I fall into the hands of fake spell caster,they rough me off and took my money without help.I have cried,I have weep"and tears runs out of eyes. The silentness in my heart brought me to the deepest path of failure that I lost my job. Crying all day,because of my life was lonely. So thanks to Ukaka that came into my life and brought me the greatest joy that was lost. I saw his mail while browsing and I contact and tell him what I am passing through with no doubt because what saw about him,was enough to believe. And I was given words of solution on what to do. I can't really help thinking about it I have tried to see what I can do, I manage to provide him some materials and he help me with the rest,after casting the spell, 12hrs later he came with rose on his hand and I was even about going out,i saw him in front of my door when he sees me he knee and said he is dying I should forgive him and accept him back he was crying,I can't wait to let him finish I quickly crab him and kiss him, just then" he said he is restless without me, just as the prophet has said he will be. He brought out a ring and put it on my hand. Our wedding day was scheduled,1week after we got married. today makes it 2weeks and we are living happily I don't know how to praise him enough, he has done me a thing I can never forget. And I can't really share to myself alone, I want y'all to help me praise him because if it is wasn't for him I already plan of committing suicide. But right now I am now so happy more than I was before. And you out there crying for help you've already got one,Ukaka is the man that you need in all rampart. contact his address if you need his service, freedomlovespell@hotmail.com also contact him on his web site: freedomlovespelltemple.yolasite.com also call Dr.Ukaka on his mobile number +2348133873774),.